INTRODUCING JOUSJOUS, A HAVEN OF HANDMADE ACCESSORIES! Well well, lookie here....news arrived in my inbox that JousJous, an online boutique offering one-of-a-kind handmade accessories, just launched their website! 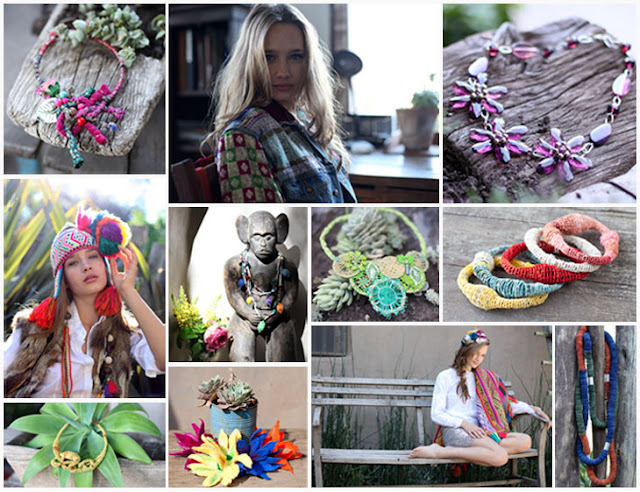 Chock full of artsy and creative necklaces (the Bromelia necklace in particular caught my eye! ), bracelets, earrings, rings, scarves and hair pieces, JousJous accessories are all made by the finest Latin American artisans and transform basic jewelry into textile art. A super awesome plus? Most of the bits and baubles available are made with recycled materials. It's a win-win people. Check out JousJous, and if you see something you like, don't forget to sign up for their newsletter....they are offering 20% off your first purchase if you get on the list! Just checked out their site and they've got such gorgeous pieces! I wish I could spend all my money on it, but alas, I'm a struggling college student. Hmph! Perhaps I'll sign up for their newsletter for 20% haha I'm cheap!